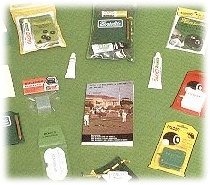 For all your Bowling accessories for the games of Bowling, Crown Green Bowls, Lawn & Indoor Bowling. Copyright © 2008 Interlinks (World Wide). All rights reserved. "A top selection of not only Bowls for the games of Lawn Bowls, Crown Green Bowls, Indoor & Rink Bowling but a full range of accessories & equipments"
"Accessories from the top designer names of Prohawk, Henselite, Drakes Pride, Taylor Bowls & Dawn Sportwear". Not only are the accessories needs for Clubs & individuals catered for but the range of Bowling equipment & accessories for the Crown Green Bowler, Flat & Rink Bowler & the Lawn Bowler cannot be beaten. A visit to the centre to see the full range is a must.